Hey there folks! 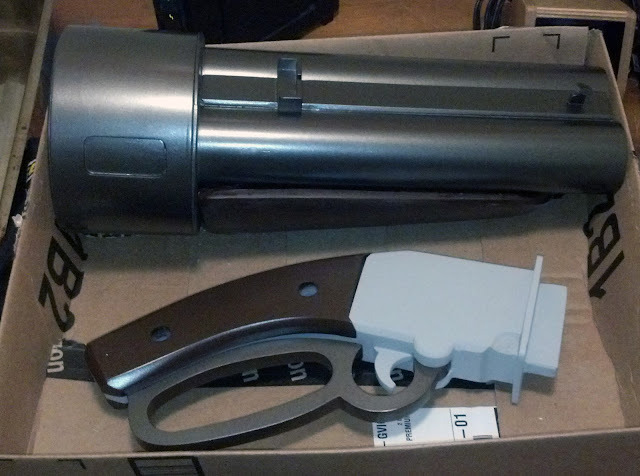 Welcome to my Team Fortress 2 'Scattergun' build. This is still an ongoing project so remember to check back every so often if you'd like to see the finished product. Feel free to post any questions or comments at the bottom of the page. If you're interested in commissioning a prop feel free to e-mail me at hvdprops@gmail.com or check out my shop on Etsy here. I hope you enjoy this build as much as I have so far; Let's get to it! 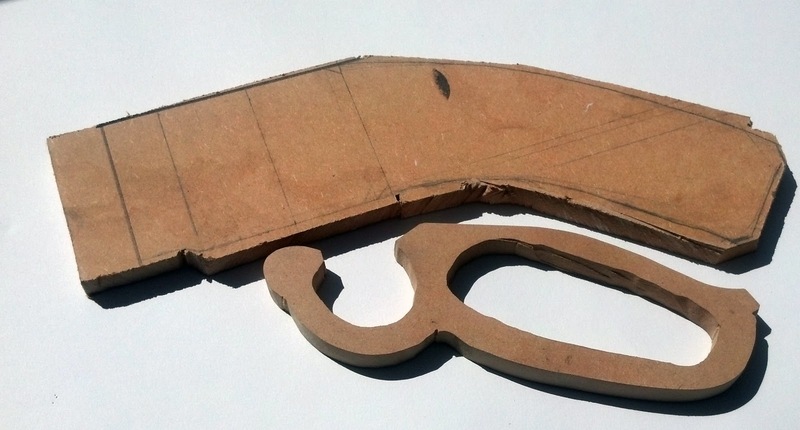 I began this prop a little differently than I have in the past, choosing to create a set of blueprints to work from. 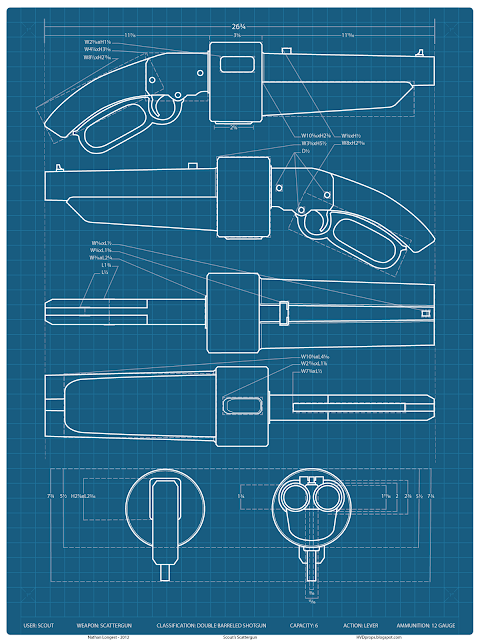 Using orthographic views I took from the SDK model viewer Valve offers I was able to draw up an accurate set of plans for this gun detailing the measurements and dimensions of the various pieces of this gun. Using pictures of the scout holding the gun I estimated it's length to be about 26 inches long giving me a base to work from when calculating the measurements. A friend and former co-worker of mine invited me over to use some of his tools to begin cutting the pieces I need. 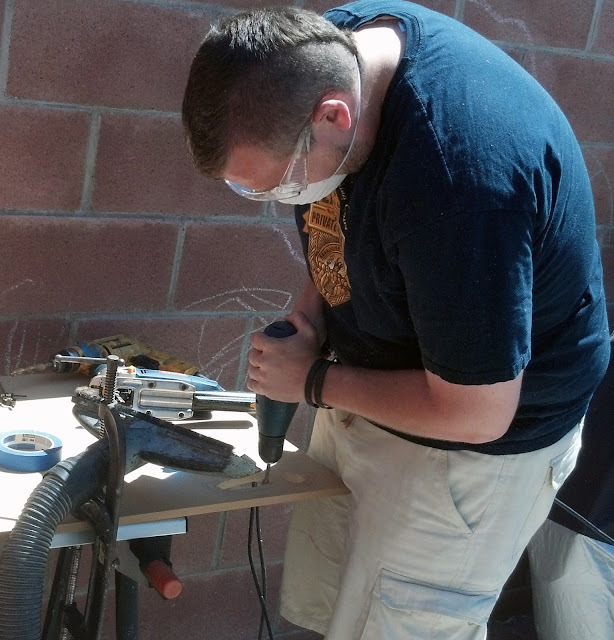 Here I am grinding the inside of the charging handle portion of the gun. 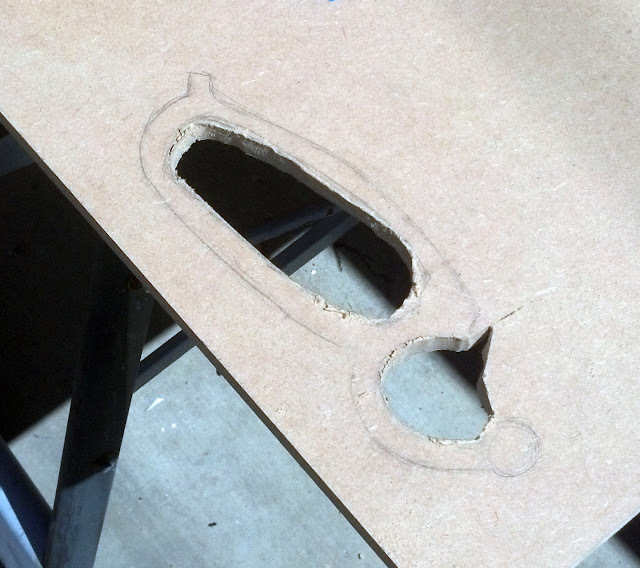 I am cutting the piece out of half inch think MDF. Here is a view of my pretty poor attempt at using a jigsaw. It is times like these I wish I had a router. Or even a jigsaw of my own. Here is the rough shape cut from the sheet of MDF. Afterward I began work on carving the fore grip out of foam. 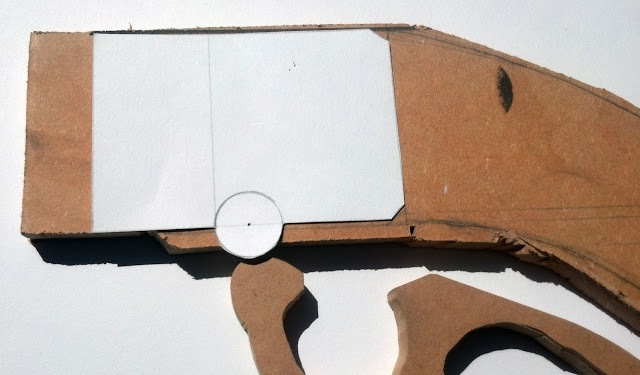 In an ideal world I would have made this from MDF, however I currently don't have the tools necessary to do that easily, so instead I stuck to my tried and true method of wrapping foam in Wonderflex. 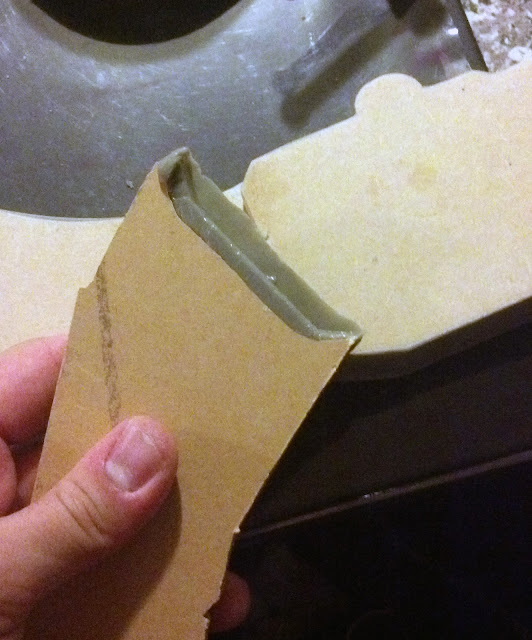 I carved this rough shape out of a scrap of foam with a kitchen knife. Once again due to the limitations of my tools I had to find other ways of carrying out some of the more intricate and precise pieces of this gun. 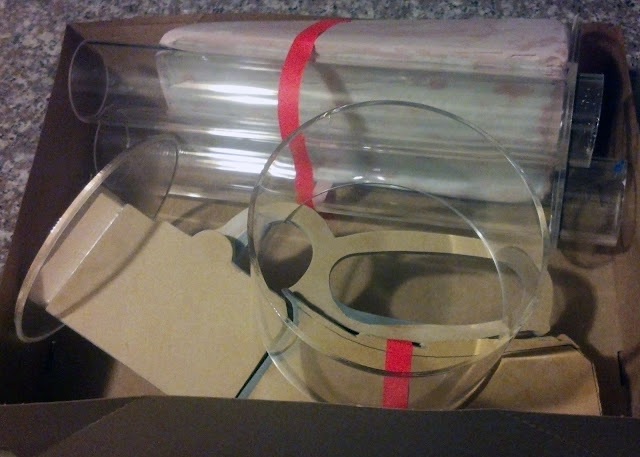 Ideally to create the drum and barrels I would have used PVC, laminated MDF circles, and a drill press, however in this case I was forced to outsource the work to an acrylic fabricator across the street from my apartment. I drew up a set of stencils and plans and handed them over to him. He was able to fashion the pieces I asked for with great precision. Here you can see one of the caps to the drum that has two holes to allow the barrels to fit in. Later on you will see the other 2 pieces and how they assemble. 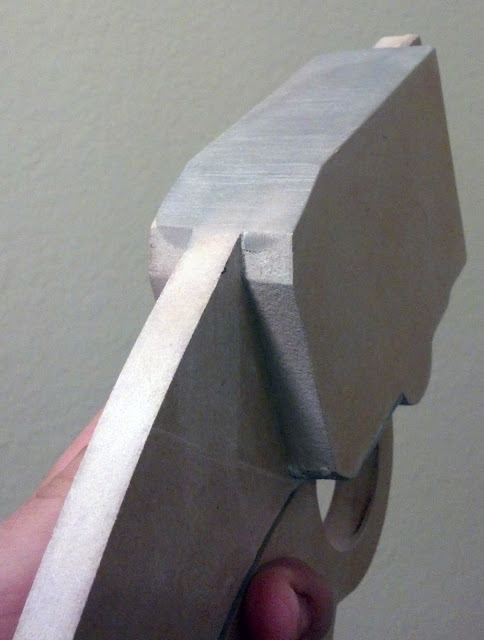 Here you can see the foam block that will later become the fore grip leaning against the barrel assembly. 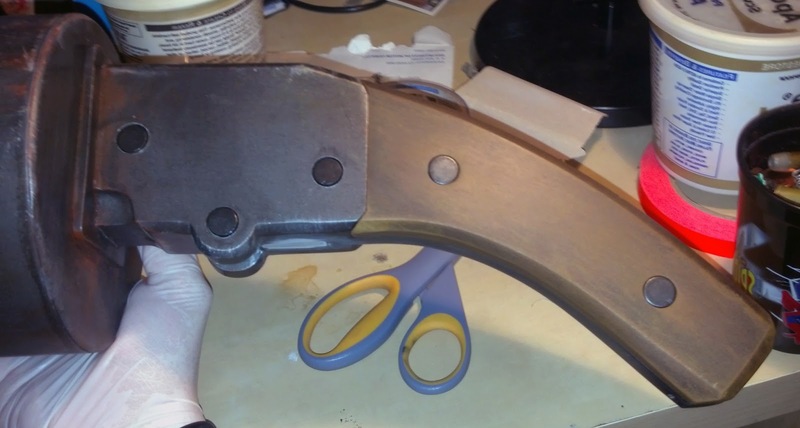 In order to route out enough foam for the fore grip to fit snugly against the curved surface of the barrels I used painter's tape to create a flat surface bridging the barrels and then attached a piece of sticky 80 grit sandpaper. 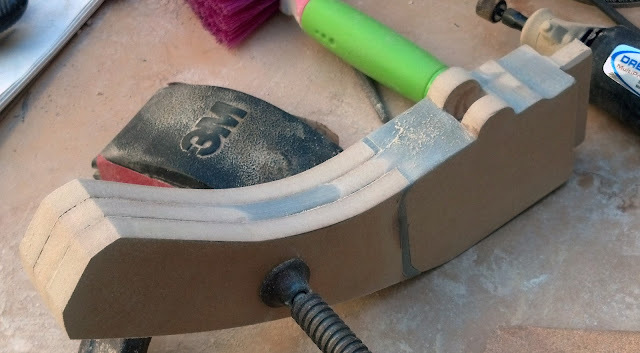 I used this to sand out the shape of the barrels from the foam block. 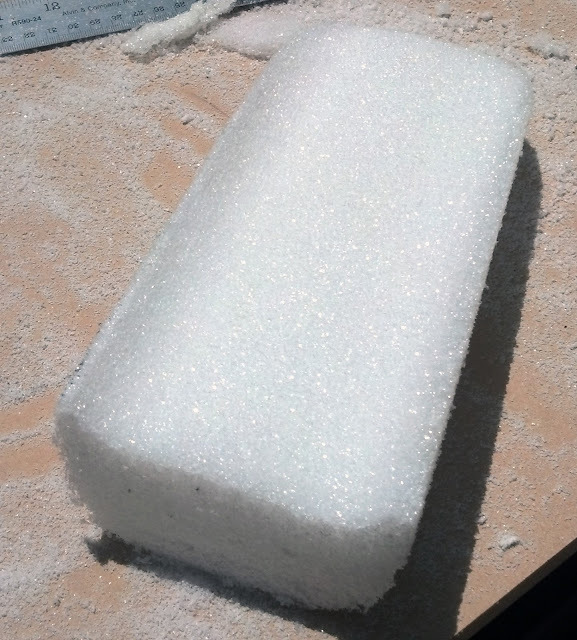 You can see here the smooth 'W' shape that is being routed out of the foam. Here is a version of the fore grip that has been a fair bit more refined from the original rough shape. 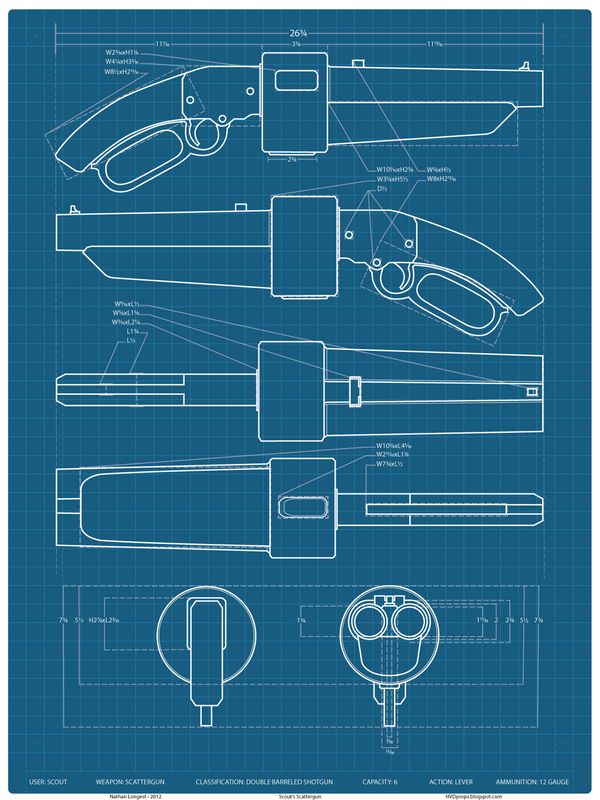 I sketched out the design for the grip section of the gun. This will later be sandwiched between several layers of MDF. 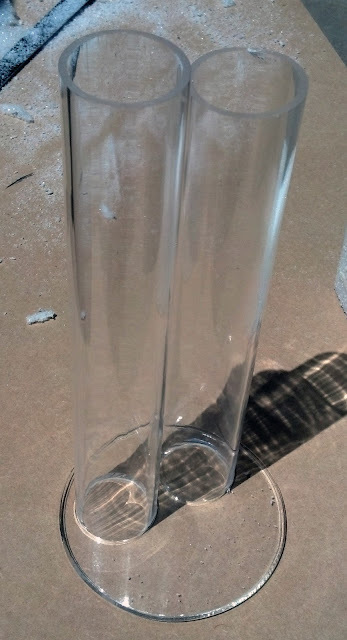 You may also notice the inch or so of extension I left on the left side of the pieces. This will later be shaped to fit into a slot that was cut into one of the acrylic discs that fits together to form the drum of the gun. I created a template from drawing paper that will be used to cut out 2 pieces in order to laminate the grip section and add width. Here you can see the two piece that resulted form the template above and how they will be attached once refined. 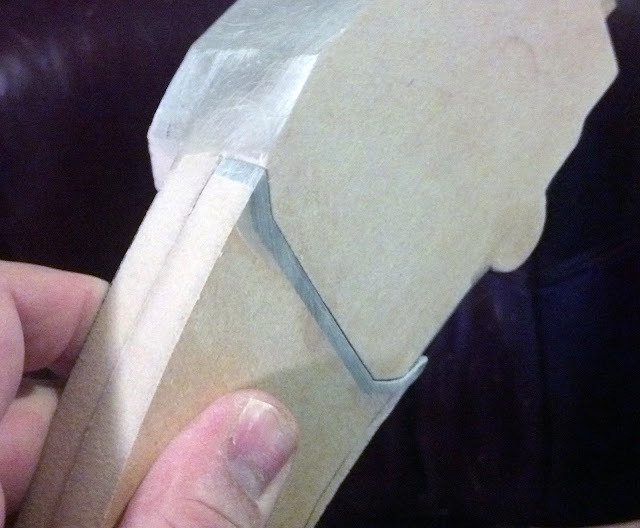 Here I am refining the rough shape of the grip portion. So here photo depicting how the drum section fits together. I am very content with the way in which I designed those to fit together. It allowed me to work individually with barrel and grip assemblies before having to permanently assemble them. Here is a section showing the pieces that make up the grip assembly at this point in the build. At this point I decided to wrap the foam fore grip in Wonderflex. Here is another view of the Wonderflex. 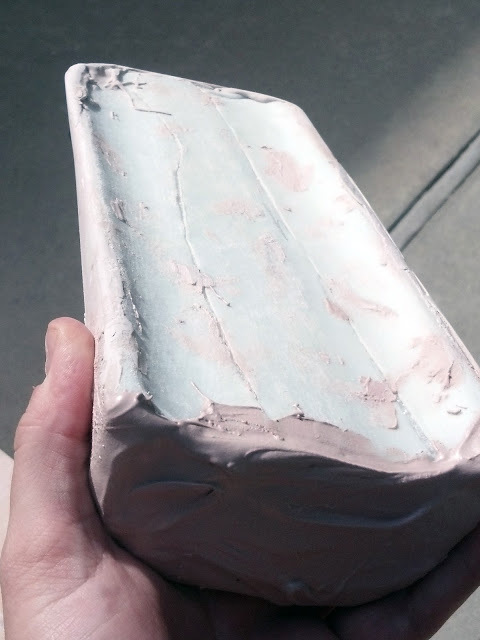 Should you attempt this technique be aware that the heat necessary to mold the Wonderflex can easily melt the foam structure underneath if not done carefully. Also, expect a lumpy and uneven product. 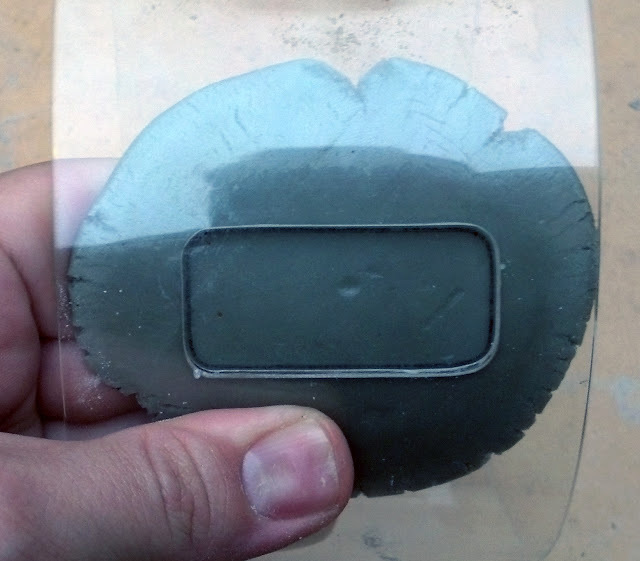 Much Apoxie Scult and Bondo will need to be applied before this shape will be finalized. 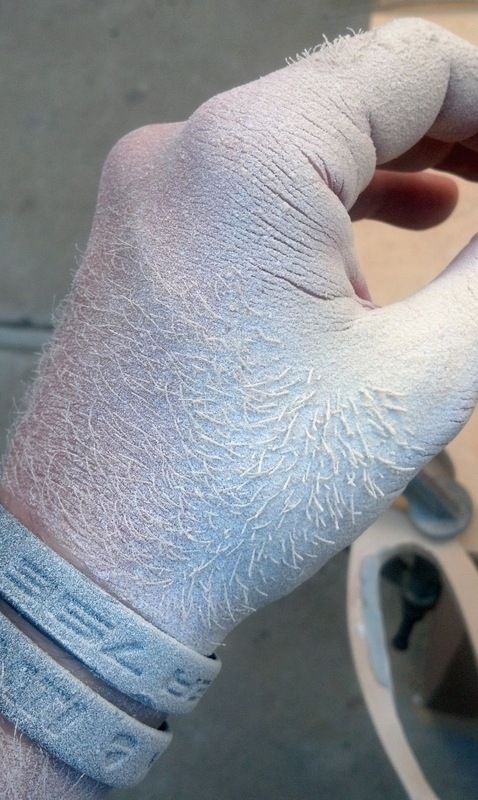 Completely unrelated to the prop build, here is a picture of the hairs on my hand being caked in dust from sanding.! Pretty neat. At this point I decided to address the over-cut I made when using the jigsaw to cut out the charging lever. With the side panels refined I used a generous layer of super glue to attach them to the maid section of the grip assembly. As you can see, this technique also easily allowed me to later fit in the charging handle. Here is a mock up of the progress at this point in the build. 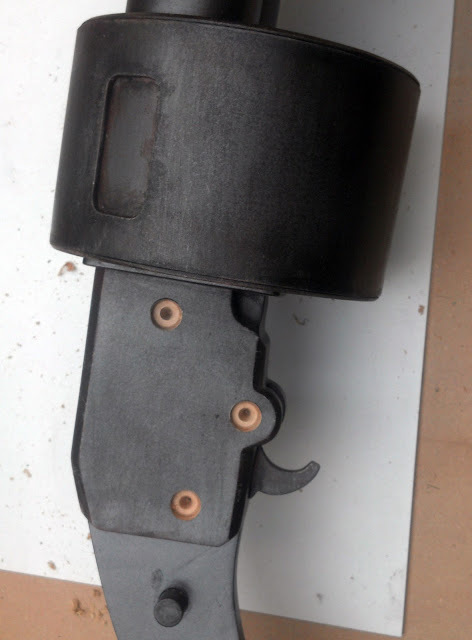 Certainly starting to see a Scattergun take form! 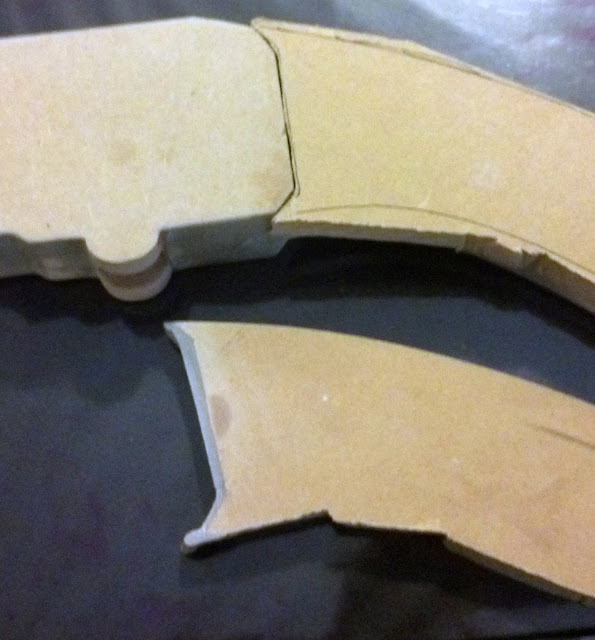 At this stage I began wondering what materials I could use to fashion the grip panels. 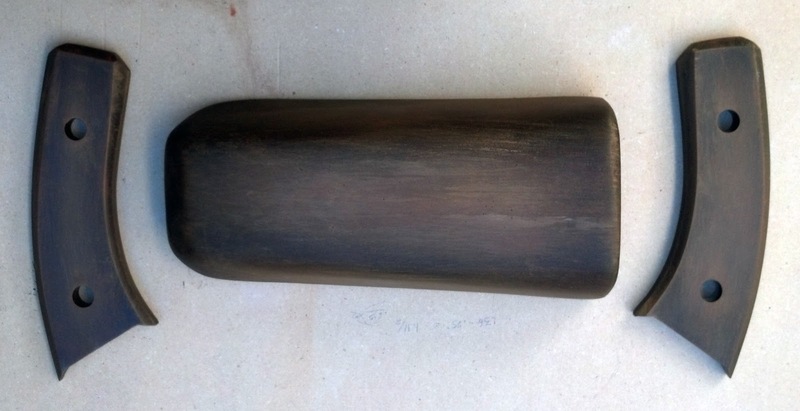 I will note here that the original design for the gun uses a solid wood handle that some how fits over a steel core and is capped with a steel plate at the end. Well, as an avid firearm enthusiast I am going to use my artistic license to correct that design and make it so there are two wooden grip panels that sandwich a steel frame. In reality I am confident this (or a solid wood grip) would be used. I decided the two grips would make for a more interesting piece and decided to go that route. Oddly enough the opposite issue arose when later building 'The Ambassador' pistol! 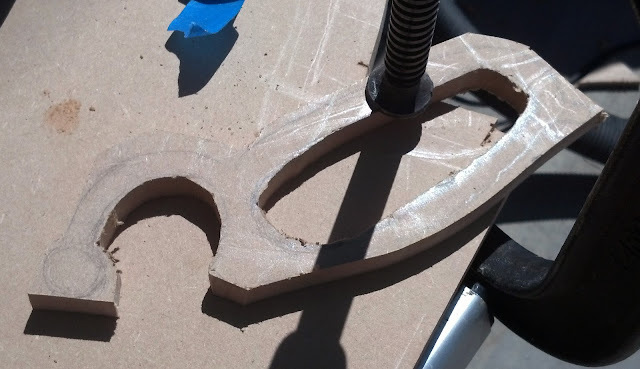 Ultimately I decided that the extra effort of cutting them out of MDF would pay off and also help me to maintain and even thickness throughout the grip assembly. Now for addressing the issue of making sure the grips conform to the trigger housing section. I decided to roll a snake of Apoxie Sculpt, lay a sheet of cling wrap (one of the most useful things I have come across in regard to Apoxie Sculpt) on the grip/trigger housing section of the gun, and forcibly clamp it to the handle. 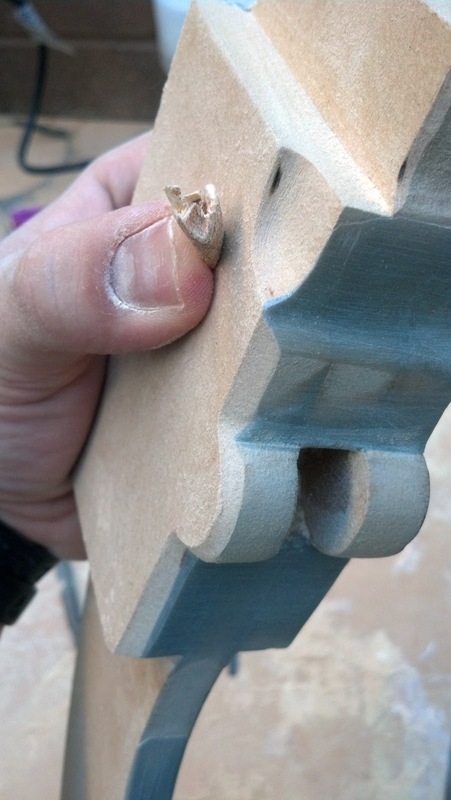 The extra material will be sanded off. In this horribly blurry photograph you can see the half sanded first attempt at the Apoxie Sculpt technique beside the other grip panel which has yet to have Apoxie Sculpt applied. 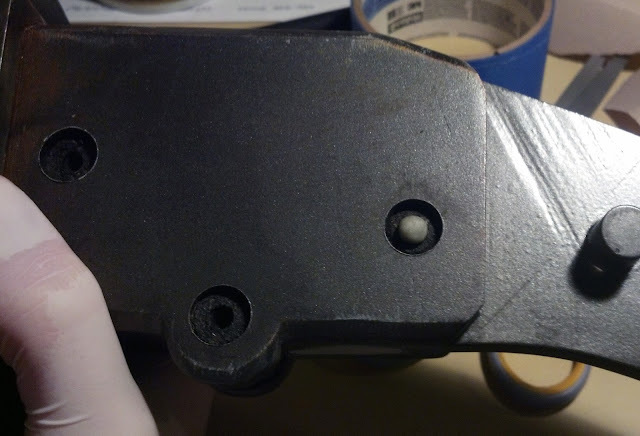 Here is what the grip panel looked like after setting and being removed from the trigger housing. 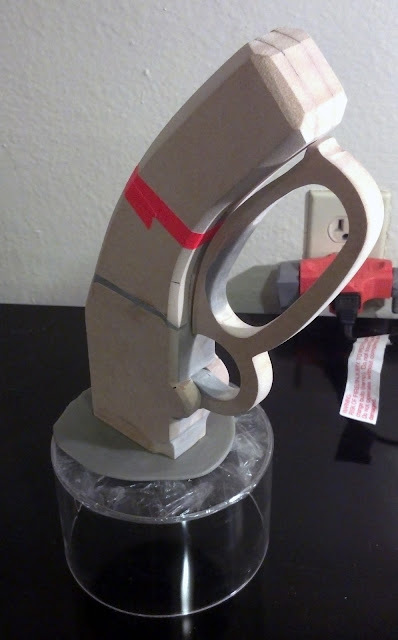 And here it is half way through being shaped to fit the grip assembly. 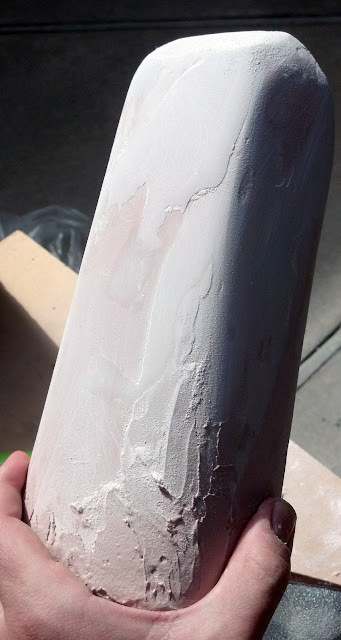 After filling in the large seams with Apoxie Sculpt I applied a generous layer of Bondo to the surface of the visible parts of the fore grip in preparation for beginning to mold the final shape. I forwent addressing the imperfections on the top of the fore grip understanding it would not be seen. 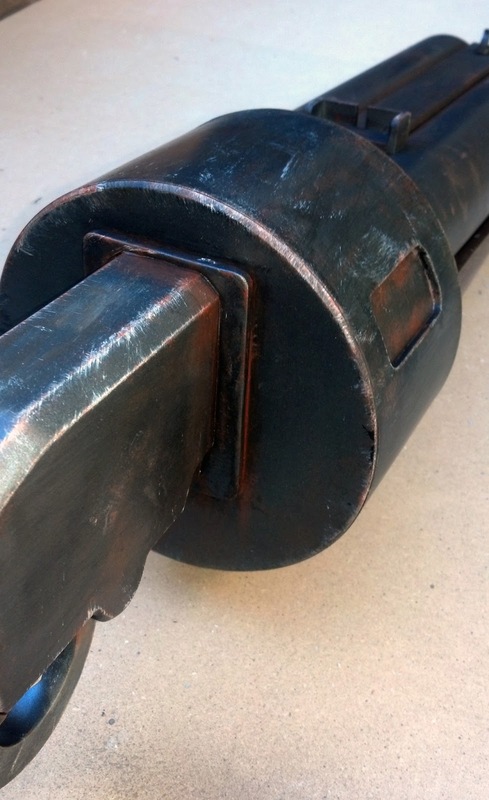 This would allow the grip to retain the maximum amount of form fit to the barrel assembly. 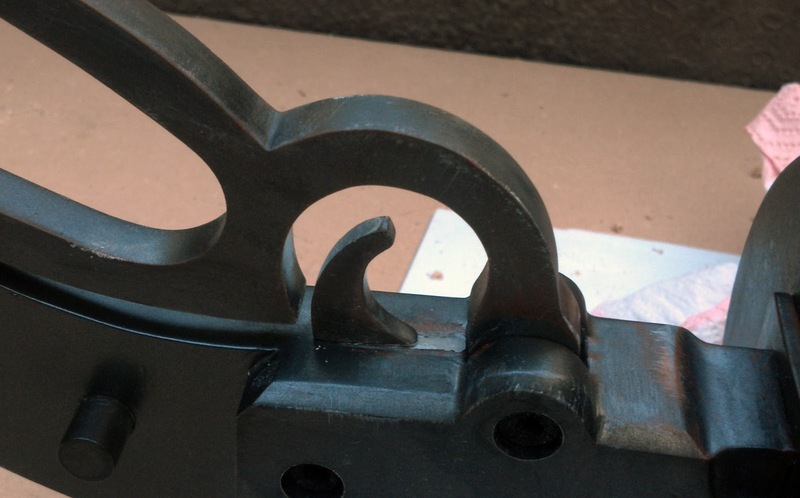 Here is a more refined version of the fore grip being held against the barrel assembly. 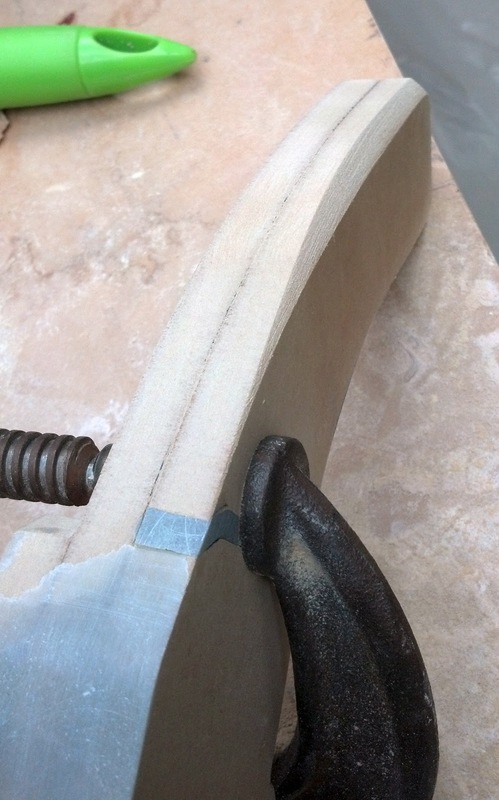 At this point I clamped both grip panels to the grip assembly in order to begin shaping the grips to the handle. 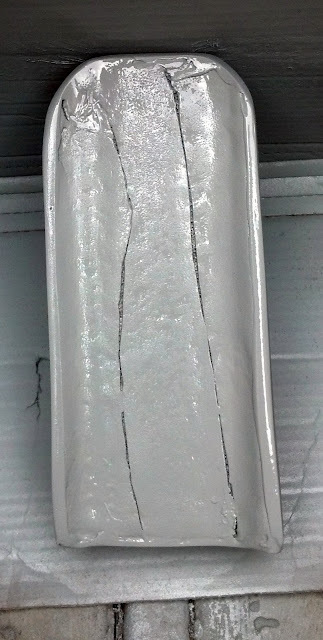 here you can see a small repair I had to make to the underside of the grip. I am still sanding all three until flush. In order to get a better idea of the overall imperfection of the fore grip I gave it a coat of primer to create a flat color base in order to see small dents that needed to be filled. 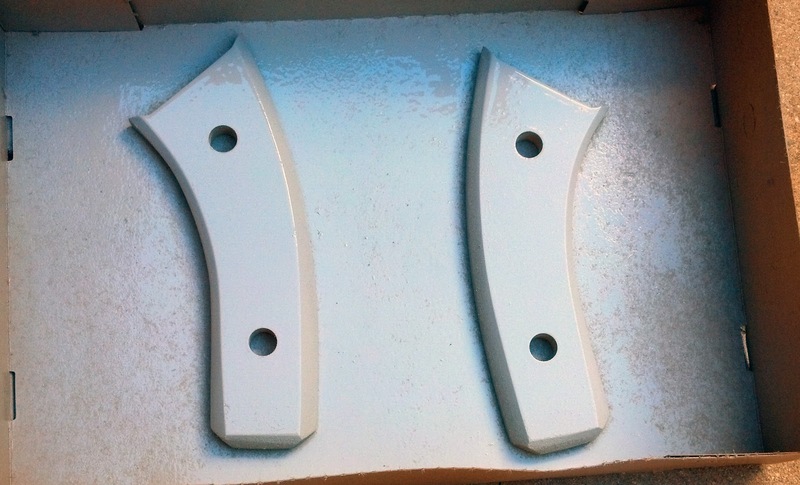 Here you can see the sanding of the initial primer coat. I would go on to repeat this process several times. Another view of the initial sanding. 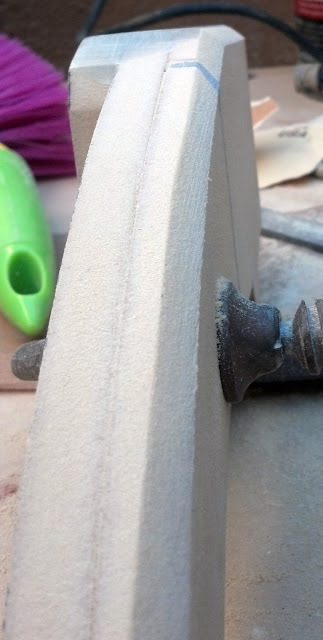 Hopping back to the grip assembly, I began to bevel the edges of the grips. More beveling. At this point I had not yet realized that the bevel carried all the way down the trigger housing to the drum. Erry' day I'm bevelin'! 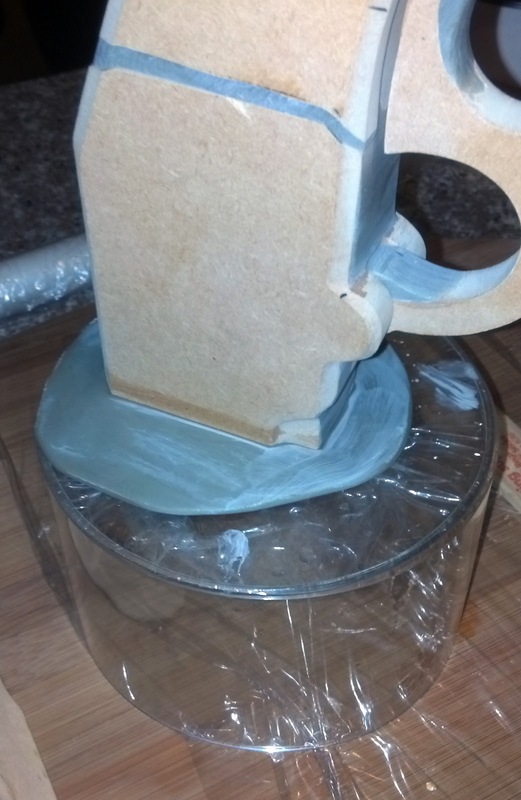 I am simply using a sanding block for this. One day I'd like to have a router! When I am a big boy, of course. You can see in the bottom left corner that I intend to take out a curved chunk of the trigger housing. I did so by taking as much material off as I could with a Dremel and then using a small wad of 120 grit sandpaper to shape it. 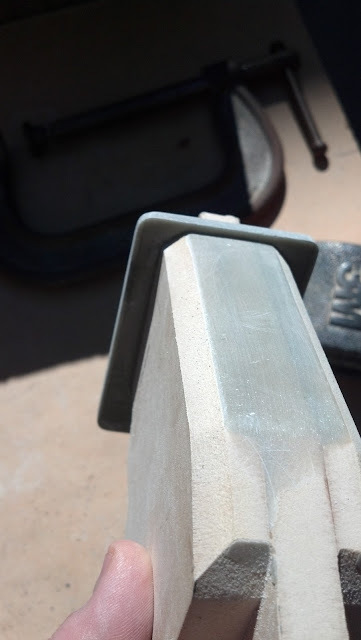 Here you can see the extent of the bevel. At this point I decided to tackle the plate that is used to attach the grip and trigger assemblies to the drip. 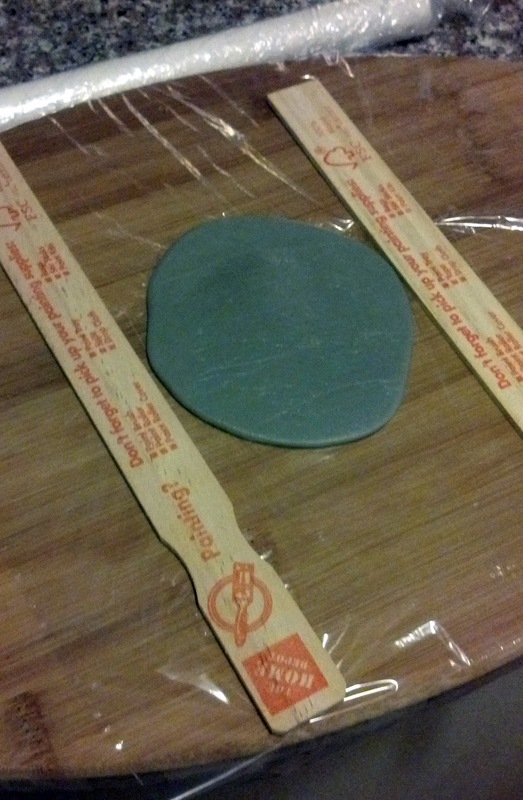 I used two paint sticks to great a rolling jig and flattened out a layer of Apoxie Sculpt to an even thickness.I used cling wrap to make sure it didn't adhere to cutting board of PVC piece I used to roll it flat. 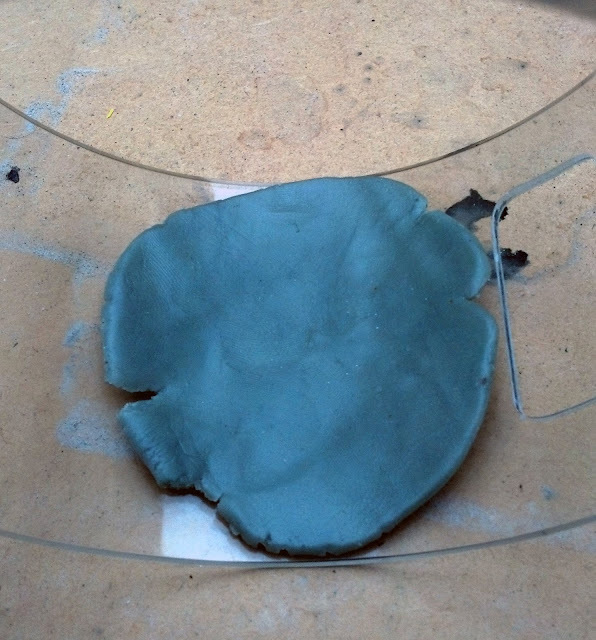 As you can see here, I then laid the sheet of Apoxie Sculpt onto the disc that accepted the grip assembly an then with a layer of cling wrap seperating it from the drum, forced the grip assembly into the slot. 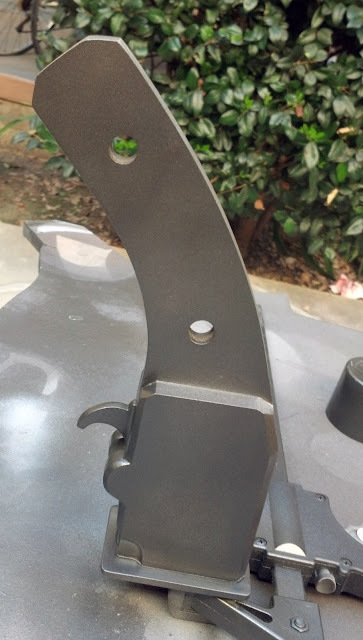 This will also attach the grip assembly to the Apoxie Sculpt and create a better fit between the plate and the grip assembly. While the plate above set, I used a painter's stick and some leftover Apoxie Sculpt to attach the flat panel that bridges the gap between the barrels. 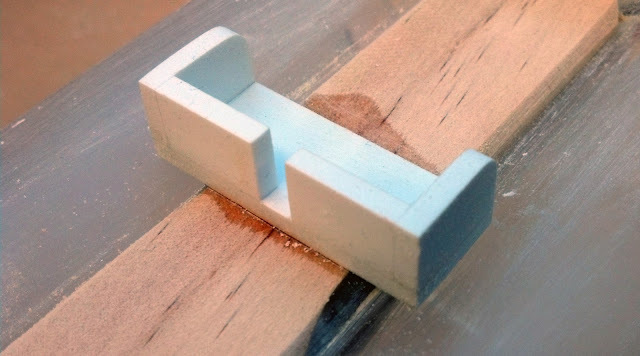 You can also see that I sanded and beveled the stick before attaching it. 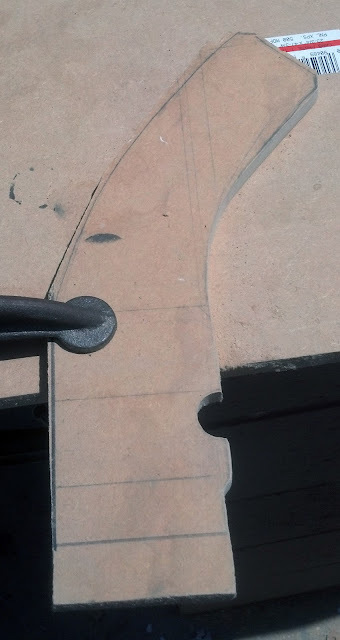 The curved cut outs toward the drum will later be covered by the front sight assembly. Here is a picture of the drum and barrel assembly with the fore grip leaning against it. 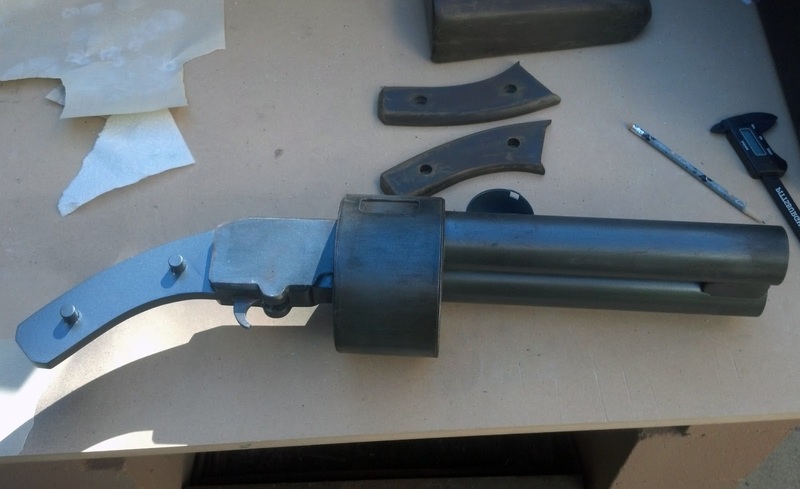 Another angle of the barrel assembly and fore grip mock up. 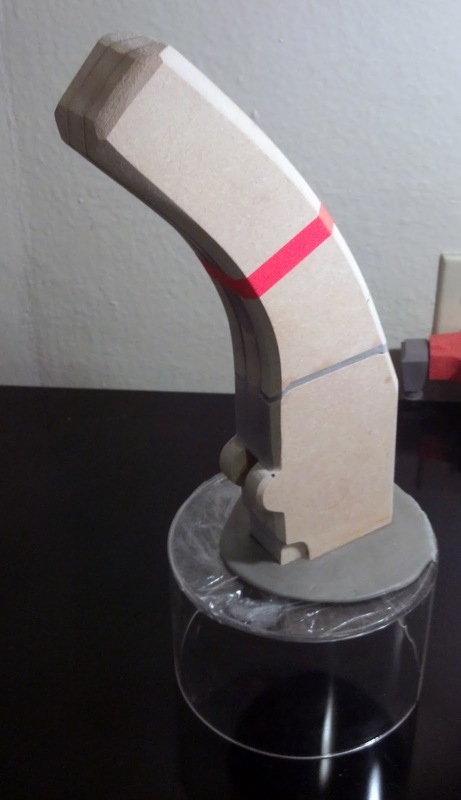 Here is the grip assembly with the layer of Apoxie Sculpt setting. Another shot, this time with the charging lever inserted. 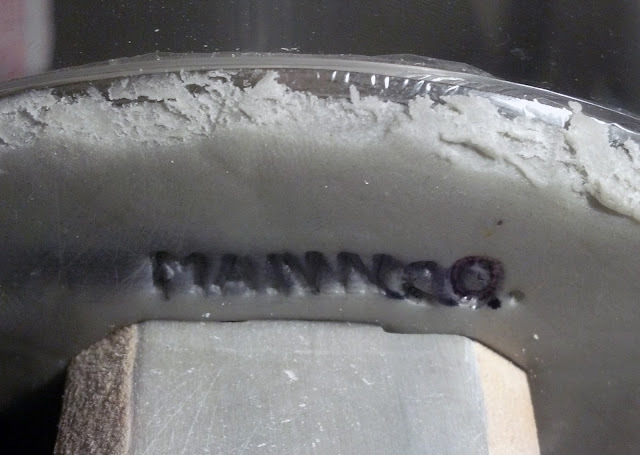 While the Apoxie Sculpt set I got the idea to stamp 'Mann Co.' into the plate. I would later need to remove it, though. 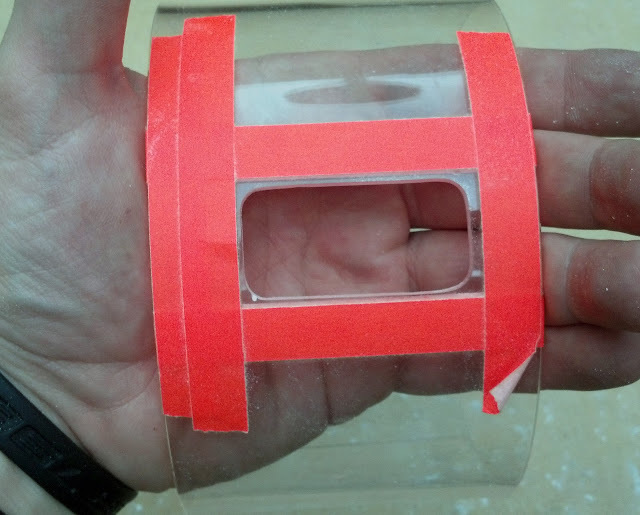 At this point I began cutting out the ejection port from the acrylic drum piece. 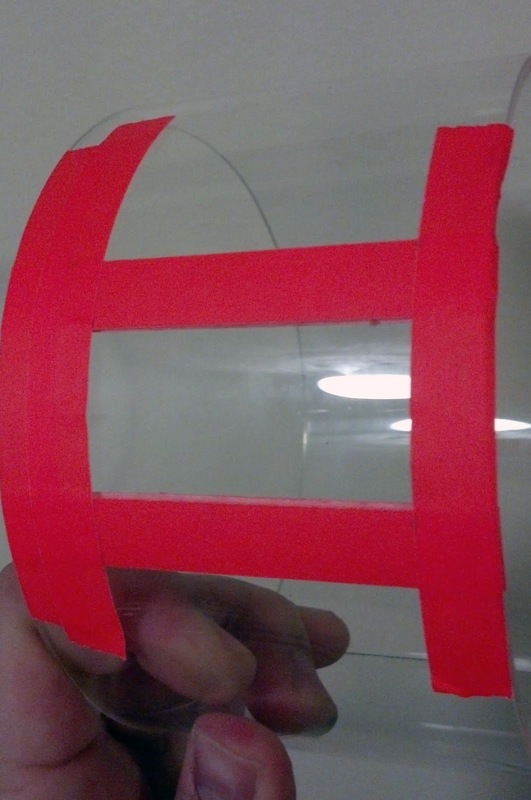 I then transitioned to the plate that holds the grip assembly to the drum. I cut the excess off with a Dremel tool then sanded down the edges until they looked the part. 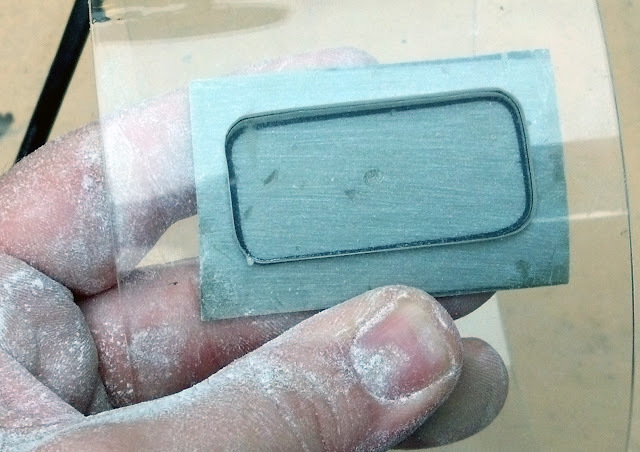 Here you can see how it will lay flat against the ejection port. This piece also required a little Bondo work. 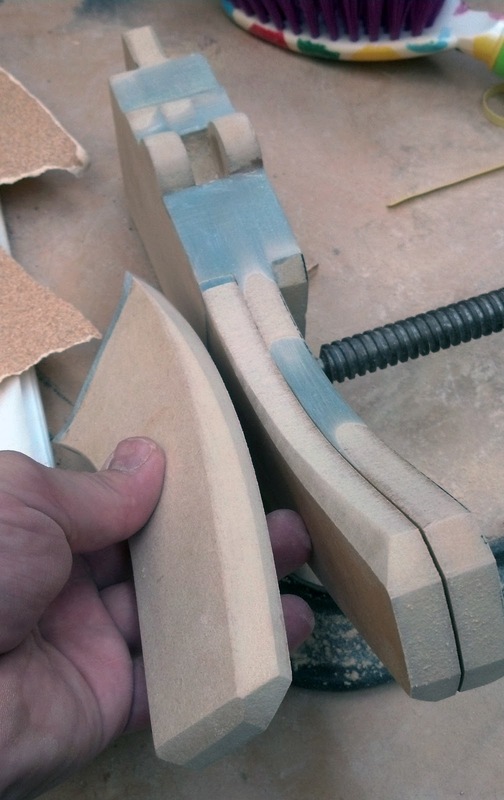 I trimmed enough of the excess material to allow space for glue to be applied to create a strong hold. Using 1/8th inch styrene sheeting and superglue I fabricated the sights. I then used a small but of Apoxie Sculpt to add detail to the front sight before gluing them on. 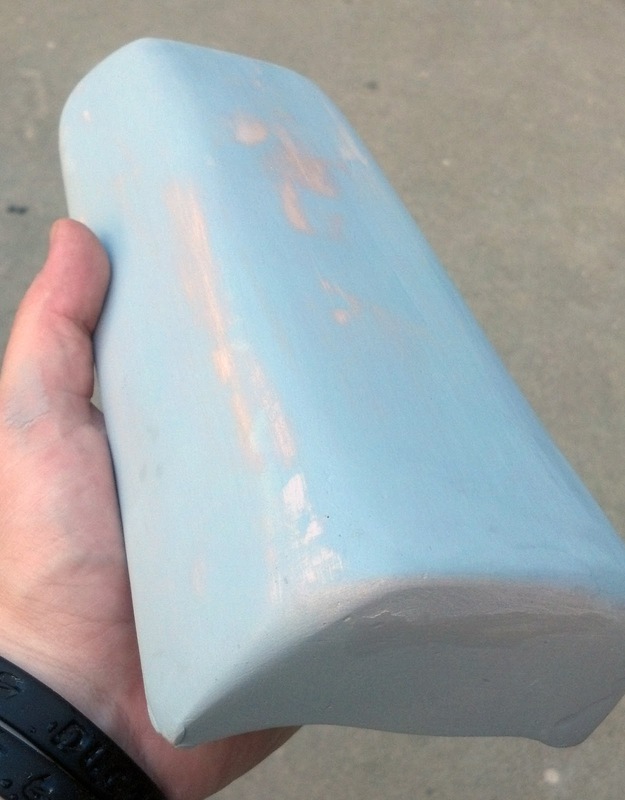 Here is the front portion, ready for priming. 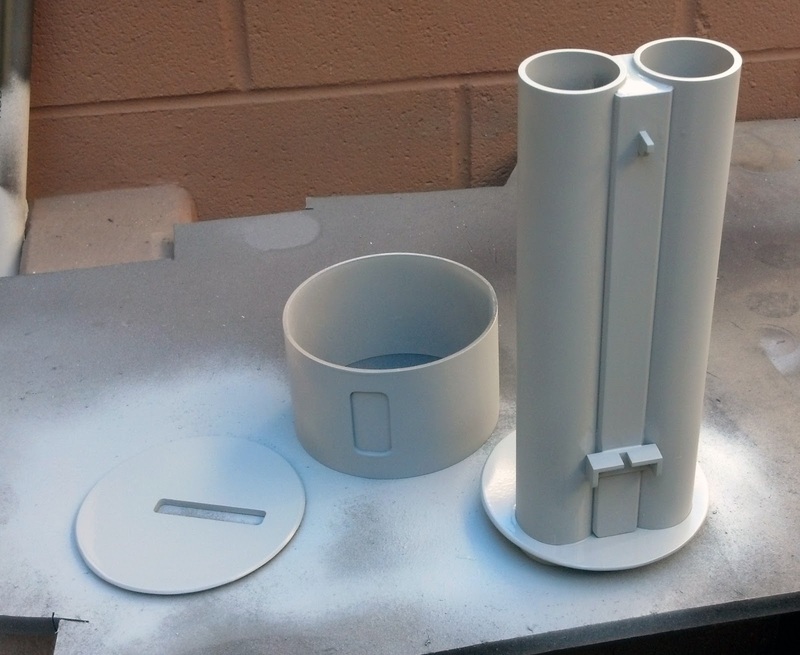 Drum pieces and barrel cluster primed and ready for painting. 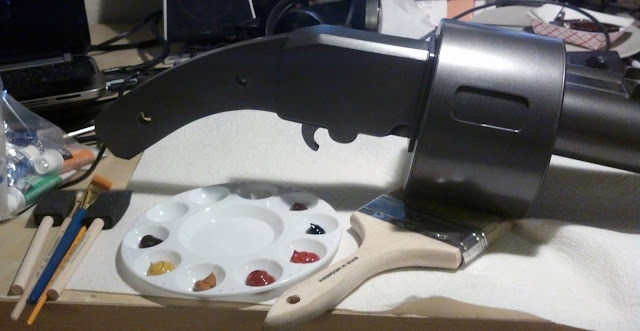 I found an amazing paint, Dupli-Color, that I used for the gunmetal base coat. I painted the wood furniture a dark brown. These clamps come in handy a lot more for holding things up than they do for holding things together, I've come to realize on this project. After a few light coats I let the piece dry. Then I returned and very carefully over-sprayed and let gravity cause the paint to fill the crease. Now it comes off as a welded piece! Speaking of gravity, that is all that is holding this together! I also find it funny that the similarity between the table's color and the ground cause the illusion of a giant Scattergun. All of the metal pieces have been glued together. Here is my dry brush setup. Various browns yellows and neutrals. The sponges you see on the left are particularly useful for creating rust, I've found. Here was an early progress shot. I like to work in layers and generally work from very rough under coats. Lots of rust and metal scratching. 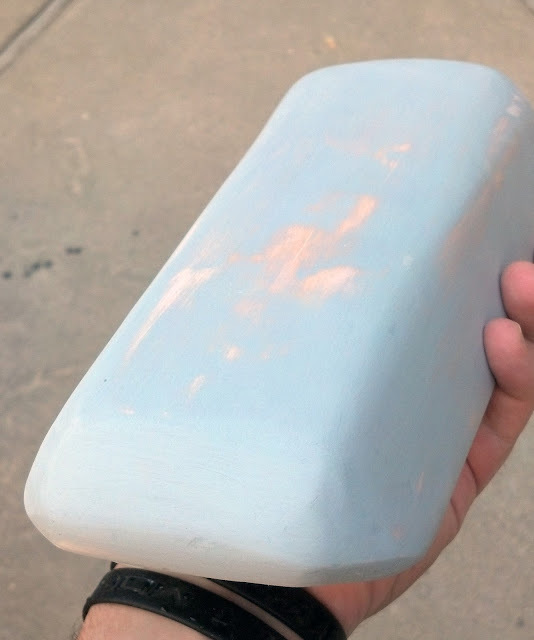 Here was my first application of weathering. A detail of the drum and receiver showing the heavy metal wear and rust buildup. What the pieces to the build looked like between painting. I have also added the grip pins; The nubs that will hold the grips in place. 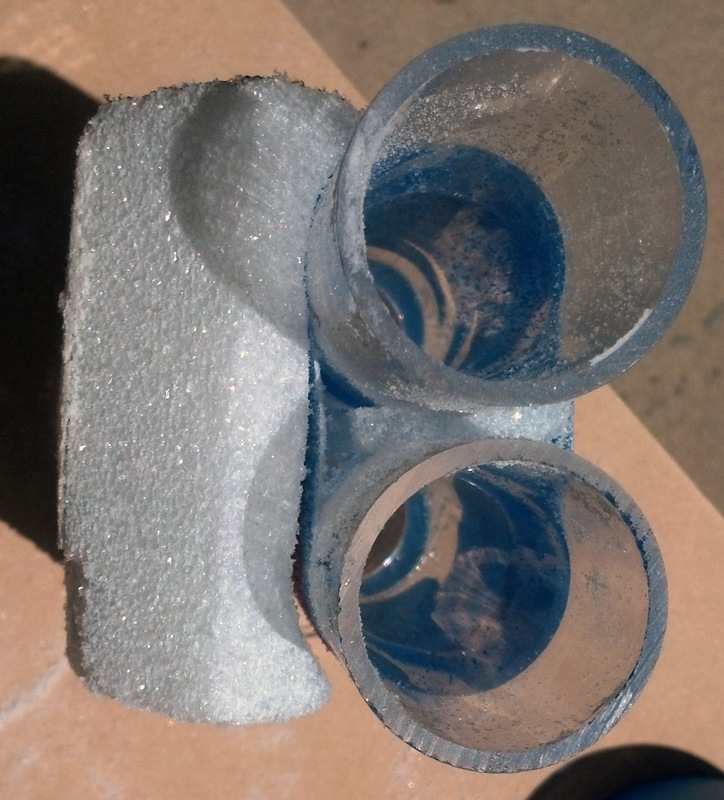 These were made from sections of half inch acrylic dowel. Here is a detail shot of the pins. I then spent about an hour or so laying up a nice worn hardwood texture. These look truly great in person! Next I used a half inch paddle but to drill 3 spots for the receiver pins to sit. I only drilled about a quarter inch down. Finally a cameo from my saw.... my only saw. 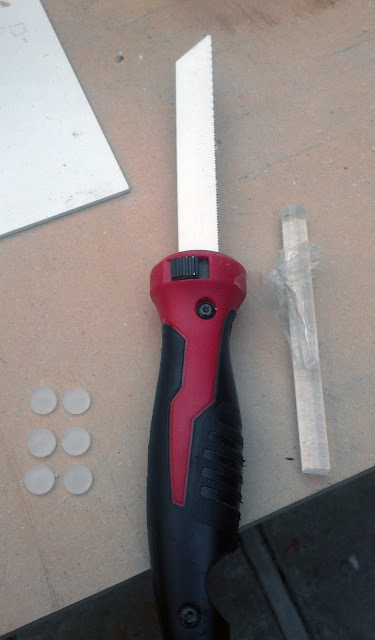 I used it to cut small slivers of half inch acrylic dowel to act as the receiver pins. I used acrylic paint to paint the insides of the holes. I then rolled up very small balls of Apoxie Sculpt and placed them into the holes. 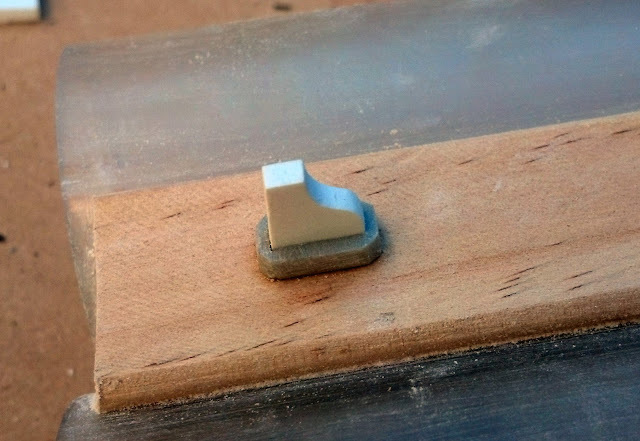 I then placed the painted caps and pressed them until they were even against the side of the receiver. You might have also noticed that I removed the trigger from the receiver. I decided to reshape and and move it back. This made it far more appealing. 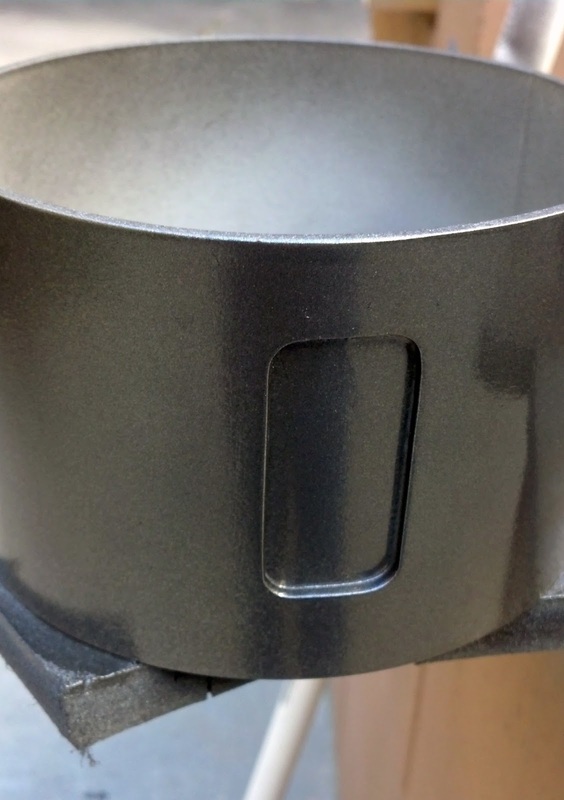 I also decided to bevel the edges of the charging lever. This unfortunately required me to repaint it entirely, but it was worth the look. And a wild Scattergun appears! It was a fun build, and I learned quite a bit! Look for beauty photos in the near future! And make sure to like my page on facebook for updated on my current projects! Awesome! I really like it! I wish i had the time to build one myself... How long did it take in total? Indeed. These can fetch a good price. And i WILL buy it if it's up for sale! There is a good chance it will be soon. Email me at hvdprops@gmail.com if you want to talk about it. Are you still making these to sell? I'm interested. where did you get the acrylic drum from? I would definitely be interested in one of these too. Avid TF2 player and would love to wow my friends with that beauty. I just finished my scattergun did it a bit different than you though feel free to check out my blog to see it.